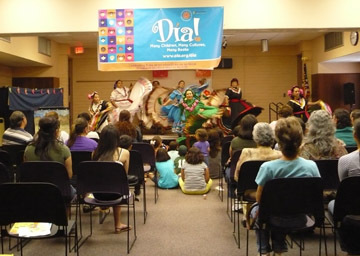 Highlights and pictures of Día 2011 were contributed by the more than 300 libraries that registered their celebrations. Included are pictures of Pat Mora’s presentation on Dia’s 15th anniversary, April 30, at the Pima County Public Library in Tucson, Arizona (the site of one of the first Día celebrations in 1997). Find Día press releases, fact sheets, logos and media relations contact information in the press kit.